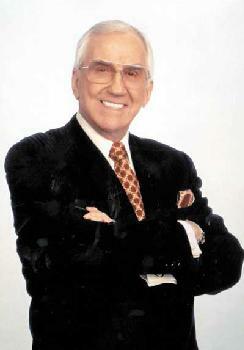 AKA Edward Peter Leo McMahon Jr.
Ed McMahon was famous for being Ed McMahon. He was Johnny Carson's sidekick for decades, and he hosted blooper shows and Star Search. If you grew up in America after the 1950s, you have probably heard McMahon's booming voice and barking laugh more often than you know. As soon as his voice changed at adolescence, McMahon got part-time work calling bingo games. He worked as a carnival barker and a street vendor, and was the unseen voice in countless radio and TV commercials. In the late 1950s, ABC had a daytime game show called Who Do You Trust?, hosted by ventriloquist Edgar Bergen and his dummy sidekick, Charlie McCarthy. When the network decided to replace Bergen & McCarthy, they brought in Carson as host, and Ed McMahon got the dummy's job. He laughed extra loud at Carson's jokes, so when Carson was picked to take over The Tonight Show in 1962, McMahon went with him. For thirty years, McMahon's job was to laugh loudly at Carson's jokes and shout "Heeeere's Johnny!" When Carson left Tonight in 1992, McMahon left as well. During and after his Tonight era, McMahon acted in cheesy movies and sitcoms, hosted "specials" on TV, was Jerry Lewis's long-time co-host on muscular dystrophy telethons, and was the perpetual pitchman for any product willing to make a check payable to Ed McMahon. Unable to do endorsement work after breaking his neck in a fall in 2006, he came close to foreclosure of his Beverly Hills mansion in 2008.